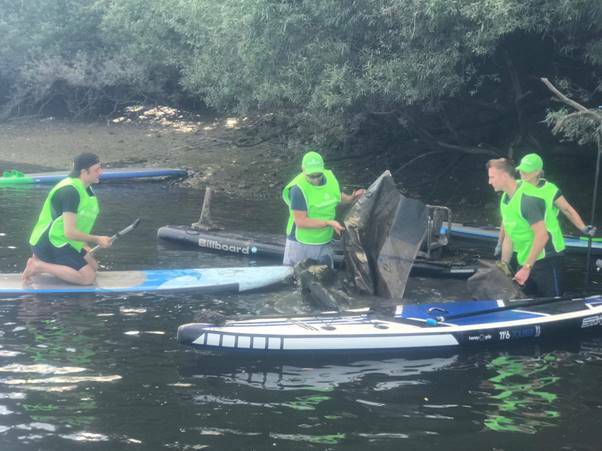 Local MP Ruth Cadbury, joined The Whale Company and Active360 on their journey paddle boarding the Thames from source to sea picking up litter along the way. Carolyn and Carlos from The Whale Company are currently paddling the length of the River Thames on their SUPs (stand up paddle boards) made out of recycled plastic bottles, to raise awareness of plastic pollution in waterways and to deliver a message from school children to parliament. Their journey began on World Oceans Day 2018 (8th June) and will continue for 300km, from the navigable source at Lechlade to the sea at Gravesend. Ruth Cadbury said: "Over the last ten years we have produced more plastic than in the whole of the last century. The global problem of plastic is escalating out of control - a rubbish-truck load is dumped into the ocean every minute and by 2050 there will be more plastic in the ocean than fish." "Although plastic can be recycled, only 24% of the five million tonnes of plastic used in the UK every year is recycled or re-used; we urgently need to rethink how we are using plastic. Well done to Carlos, Carolyn and all those involved in this feat which will raise awareness of this issue and pick up plastic litter along the way." In 2017, Carlos and Carolyn became the first people in the world to paddle a marathon on a SUP board made out of plastic bottles. They went on to paddle 12 marathons in 12 countries in Europe, catching the eye of the European media. Documentary maker, Bethany Staley will be filming the expedition and we would be delighted if you would like to participate.